Yellowstone National Park has been a top tourist destination since its opening in 1872. 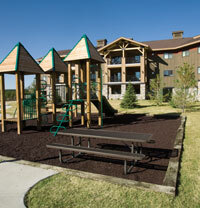 And your WorldMark West Yellowstone is the perfect location for seeing the park’s hundreds of geysers (including the world-famous Old Faithful), pools of boiling mud, and an amazing assembly of wildlife, such as bears, wolves, bison, and elk. Yellowstone’s west entrance is just one block from your resort. While the national park is certainly its top draw, West Yellowstone (pop. 1,177) is also an ideal location for skiing, snowshoeing, and snowmobiling. The area’s back country and telemark skiing is considered tops in the nation. You can also discover the town’s gift shops, galleries, and specialty stores, and take in a show at the Playmill Theatre downtown. For inquisitive minds, there are two museums that should not be missed. History buffs should head to the Museum of the Yellowstone, which depicts the area’s early days. And The Grizzly and Wolf Discovery Center—right across the street from your resort—gives you the chance to learn about these animals up close and personal.